This guide is for the GBA version. For the PC version, see The Sims 2. For other consoles, see The Sims 2 (console). 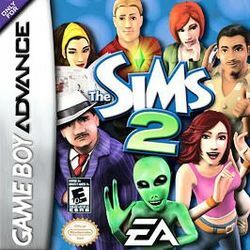 For the Nintendo DS version, see The Sims 2 (Nintendo DS). For the PSP version, see The Sims 2 (PlayStation Portable). This version of The Sims 2 takes place in Strangetown, and shares a similar GUI to its predecessors (The Sims Bustin' Out and The Urbz). In it, you create your sims to star in a TV series called 'Strangetown'. Your sim then stars in 12 episodes of the series. In between episodes, you play mini games and connect with other sims. This page was last edited on 4 November 2015, at 23:03.